Sticks are rich and buttery in texture. The pigments slide right off the stick without any crumbling or breaking. Schmincke's generously sized full stick measures 2-5/8" long × 7/16" in diameter (67 mm × 11 mm). Schmincke offers 55 pure colors, each of them available as a pure color (D), or in gradations with Black (B) and White (H, M, O): B — Black gradation with a color. 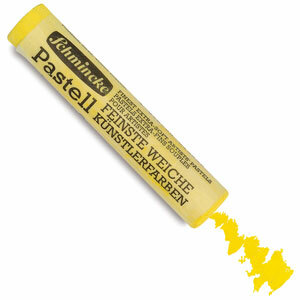 Schmincke Artist Pastels also include a selection of 13 Dark Tones, available only in one concentrated gradation. White, Black, Serious Black, Silver, and Gold are also available only in a single gradation. Gift Idea — A variety of special combination Schmincke Pastel sets are available. See Schmincke Soft Pastel Sets for pictures and more detailed specifications of these sets.